PLEASE NOTE: NO CALL-OUTS. NO EXCESSIVE TARDINESS AND OR BREAK /SIDE TIME (EWT, BATHROOM, ETC.) VIOLATIONS. LIMITED POSITIONS AVAILABLE. ​Terms and conditions are subject to change. This image referenced above is for satire purposes only. Dealers's Greatest Assets does not condone nor authorize any musical artists, songs and or lyrics. Work entire scheduled shift. For each additional hour you work, you receive your hourly pay rate (and overtime if applicable) and an additional$25 for each hour. Overtime is subject to working more than 40 hours per work. 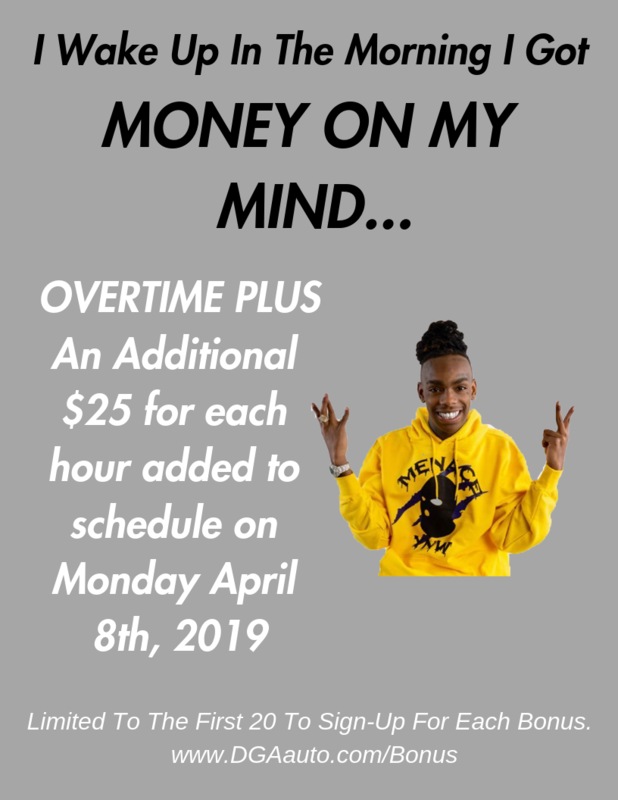 Receive $25 for each additional hour worked on Monday April 4th 2019. Paid via Paycheck or Gift Card (VISA or Target).